About 270 community members gathered at Parklawn Assembly of God Church for Milwaukee PBS’ event. Photo by Andrea Waxman. MPS teacher Lakeshia Myers has observed police harassment of African-American residents and is sometimes asked by her students for help interpreting and responding to that behavior. She advises them to do the best they can to make it home alive and to always be respectful to officers. But, she said, she is “heartbroken” that she has to have those conversations. 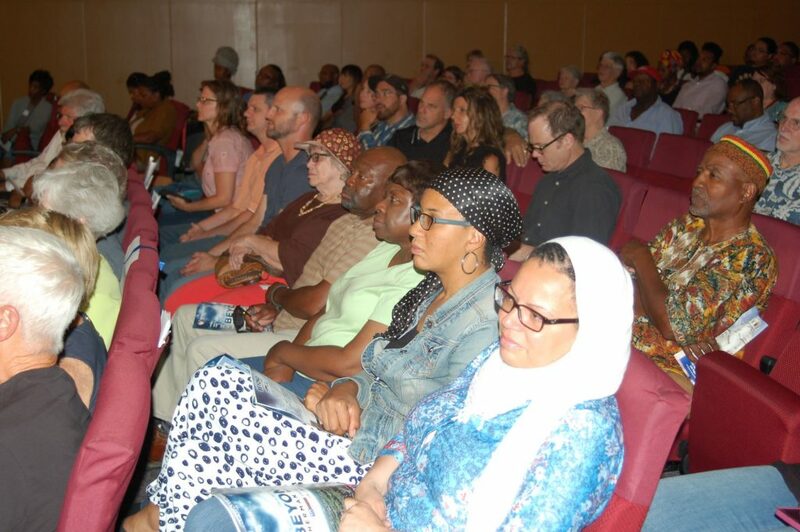 Myers, who is black, was one of 270 people who came to “Beyond Sherman Park,” a recent community gathering organized by Milwaukee PBS and WUWM Milwaukee Public Radio. The event addressed the state of the central city a year after violent protests broke out in response to the shooting of Sherman Park resident Sylville Smith by a police officer on Aug. 13. 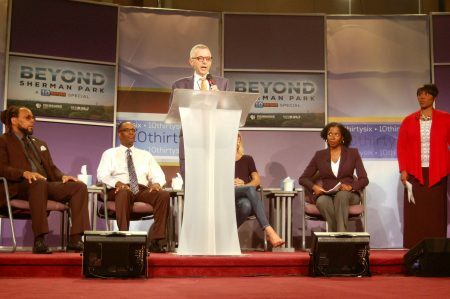 Bohdan Zachary, general manager of Milwaukee PBS, welcomes the audience, as (from left) James Causey, Reggie Jackson, Laura Marshall (obscured), LaToya Dennis and Portia Young stand by. Photo by Andrea Waxman. Audience member Peavy Holmes noted that Milwaukee’s high rates of segregation and African-American male unemployment, as well its failing school system, were contributing factors to the unrest. Holmes is assistant director for life underwriting at Northwestern Mutual. “When my brother and I were growing up we used to run up to police officers because they gave out baseball cards. When a cop pulled up in the neighborhood, we’d run up to their cars,” said Holmes, who is black. The police could use more sensitivity or soft skills training, Holmes noted, adding that he and his brother, who lives near Sherman Park, agreed it would nice if the police could rebuild relationships like they had when they were boys. Attendees had differing opinions about whether more teens and young adults are engaging in the community since the events of last summer. Myers said that if the community wants to hear more from young people it needs to go where they are, as Program the Parks founder Vaun Mayes has done in Sherman Park. Moderator LaToya Dennis takes a question from attendee Darrin Madison. Photo by Andrea Waxman. Holmes, who grew up on the Northwest Side and now lives in Hales Corners, said his brother and younger cousins, who live in the Sherman Park area are constantly discussing ideas for solutions to community problems. Panelist Reggie Jackson, head griot at America’s Black Holocaust Museum, postulated, “No downtrodden community in history has healed itself alone,” igniting a discussion about what kind of help is needed from the city, county, state and residents of other parts of the city and suburbs. Jackson was on the panel along with James Causey, Milwaukee Journal Sentinel columnist; and Laura Marshall, a Sherman Park resident. WUWM’s LaToya Dennis moderated. “What we need is action and not just lip service,” Myers said. She noted that after an incident such as the Sherman Park uprising, the community sees an outpouring of questions about why it happened. She noted that the community knows that housing and poor schools are issues and they have said that repeatedly. “But we don’t actually do anything to fix them,” she added. Myers was disappointed that Sherman Park’s elected leaders said little during the discussion. “People want to see action …. I would have liked to hear more from the representatives … about plans that they may have in place or programming that they may be aware of to help the constituency they serve.” She gave kudos to Sen. Lena Taylor, who does not represent Sherman Park but who discussed community issues in a video interview. According to Holmes, it is essential that Milwaukee’s education system and the job prospects for African-Americans be improved. We have to have jobs that are attainable with a high school education, Holmes said. “If you’re left with the option of no work … then your alternative is to do something illegal to make money for your family,” he added. Myers, Parham and Holmes, all in their 30s, suggested solutions. “We have to strap up our boots and do more to engage one another and that starts at the basic human level of knowing who your neighbors are, making sure that you know … who the people are in the next five houses down, that they know my children, that they are able to tell me what’s going on when I’m not present,” Myers said. Parham would like to see more parental and community involvement to make the neighborhoods better, she said. “Part of it is we have to help ourselves. African-Americans have to reach into our own pockets and help ourselves first,” said Holmes. 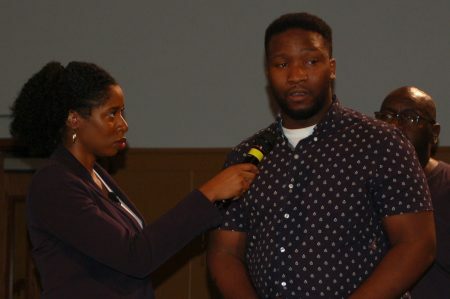 The discussion, which was held at the Parklawn Assembly of God Church, 3725 N. Sherman Blvd., was hosted by Portia Young of Milwaukee PBS’ 10thirtysix. It will be broadcast on Aug. 10 at 8 p.m. on Milwaukee PBS and WUWM 89.7 FM.